Creepstone Manor has been closed for nearly one hundred years, standing dark and silent above the town of Creepstone and that's just the way resident ghost Spookie likes it! Prey on the phobias of guests by turning into their worst nightmares. 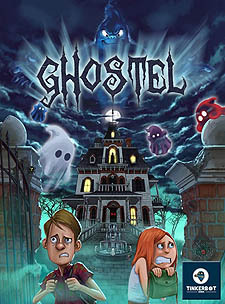 Work with other ghosts to combine forces, and scare away the hardiest of hotel patrons to earn upgrades and get even scarier. The randomised guests and dice roll mechanic means each round is different from the next, but there's more than luck to winning the game.